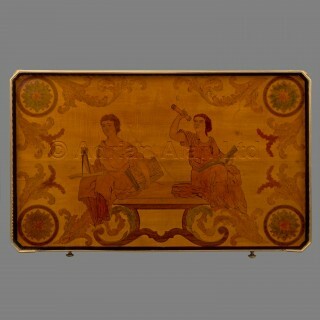 A Louis XVI Style Gilt-Bronze Mounted Mahogany and Marquetry Inlaid Writing Table After The Model by Jean-Henri Riesener. This finely inlaid writing table is based on the famous ‘Table des Muses’ by the eighteenth century Royal ébéniste Jean-Henri Reisener. 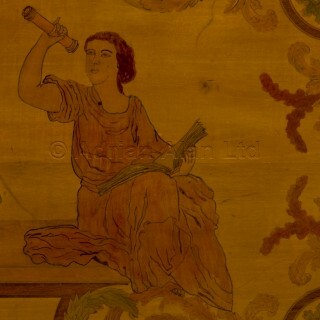 The galleried top is inlaid with an allegorical scene of muses representing astronomy and mathematics. 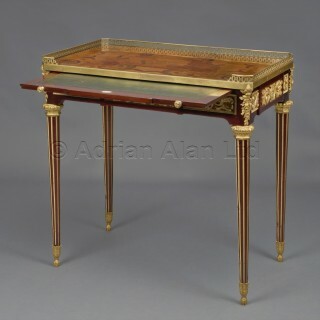 Although for many years thought to have been made for Marie Antoinette, Jean-Henri Reisener’s original version of this table, known as the Table des Muses, was in fact supplied in 1771 at a cost of 6,000 livres for the personal use of Pierre-Elizabeth de Fontanieu, Intendant et Contrôleur Général des Meubles de la Couronne from 1767-1783. 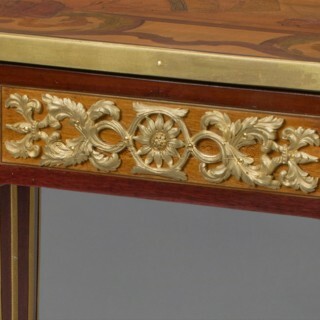 During the Directory, the table was used in the Salle du Conseil des Directeurs and later it was moved by the Empress Eugénie to the Petit Trianon, where it remains today. The table remained a popular model throughout the nineteenth century and was made by celebrated ébénistes such as Beurdeley and François Linke. An example of Linke’s index number 251 is shown in the Elias Meyer residence at 16 Grosvenor Square, London (C. Payne, (Woodbridge, UK), 2003; p. 246). Jean-Henri Riesener (1735-1806) lived in Paris and was the foremost cabinet-maker of his generation and the successor to the court patronage of Jean-Francois Œben, whose widow he married in 1767. From 1774 to 1784, Riesener supplied more than 938,000 livres worth of furniture to the Garde-Meuble Royal. He was responsible for many important contributions to the formation of the Louis XVI style in France, of which he was undoubtedly the master. Riesener began his career for the monarchy with the roll-top desk for Louis XV placed in his inner study. Commissioned in 1760 from his father-in-law and master Œben, it is a piece of furniture exceptional for its novelty, the refinement of its marquetry, the quality of its bronze details and above all the ingeniousness of its mechanism: all the desk closes with a single turn of the key and opens just by pressing a button. Completed in 1769, it was modified by him during the Revolution when he had to remove the royal symbols. 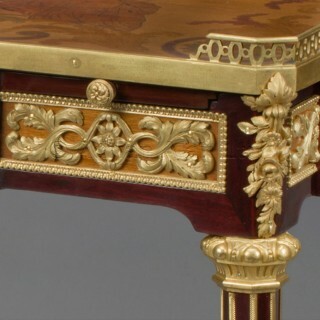 The prestige of this piece of furniture was immense and definitively established the reputation of Riesener. 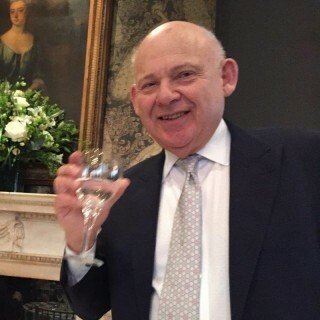 From this time on, there was no shortage of commissions from the court and for ten years he was the principal supplier to the royal residences. 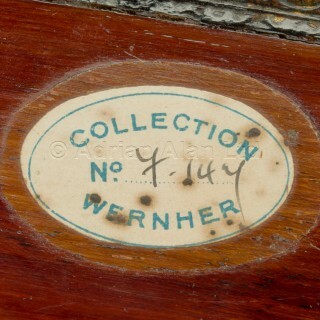 But his outrageous prices lost him a part of his clientele which turned to his rival Benneman. Marie-Antoinette, however, remained faithful to him. Riesener produced his most graceful and innovative pieces of furniture for Marie-Antoinette: In particular for her boudoir at Fontainebleau, he produced fragile furniture decorated with mother-of-pearl that was unique in its genre. Pearl was a particularly exotic material at that time and using it to cover the entire surface of an object was the height of luxury. 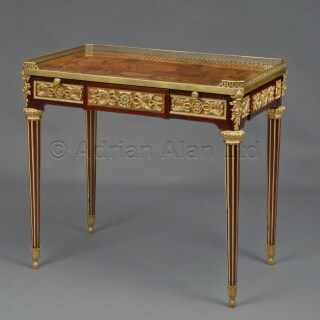 His furniture was much copied during the nineteenth century, in particular the ‘Bureau du Roi’ at Versailles, of which a superb version was made for the 4th Marquess of Hertford and is now in the Wallace Collection. Ledoux-Lebard, Denise. Les Ebénistes du XIXe siècle, Les Editions de l’Amateur, (Paris), 1984; p.555. Kopf, Silas. 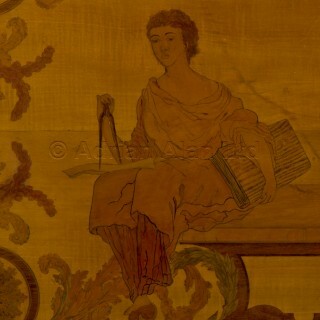 A Marquetry Odyssey: Historical Objects and Personal Work, First edition, 2008; p.109.